We all know crucifixion is painful. It’s hard to even think about it without cringing in pain. Yet it wasn’t until I got to reading Adam Hamilton’s Last Words that I realized the implications of crucifixion on speaking. Hamilton explains that in order to speak from the cross, Jesus would have had “to pull himself up by the nails in order to expand the diaphragm to speak.” The pain he must have gone through to speak gives his final words great impact. They are words for us to take to heart as we think about what it means to be followers of Christ today. If you haven’t already signed up, I invite you to join one of our small groups this Lent that will look at Jesus’ final words together. The small groups will run for five weeks beginning this coming week. If you’ve never participated in a small group or a Bible Study before, don’t worry! You’ll be in good company of people who are giving it a try for the first time. There’s no required preparation. You can read along chapter-by-chapter in the book if you would like. If not, you’ll still easily be able to jump into the discussion. If you’ve been looking for that “next step” in getting to know people at Abiding Presence and/or growing in your relationship with Jesus, the midweek Lenten small group experience would be perfect. On Ash Wednesday we heard the invitation to the Disciplines of Lent - repentance, prayer, fasting and works of love. I encourage you to be intentional in your response to the invitation to add these disciplines into your life for the next six weeks in intentional ways. Joining a small group - even if it takes you a little outside of your comfort area - might be a great place to start! Every Sunday Pastor Heidi or I stand behind the altar at the time of Holy Communion and offer the invitation, “This is the Lord’s Table and all are welcome here.” Most Sundays when I am behind the altar, you hear me say it twice so that I am book-ending the instructions on how to receive Holy Communion. Why? Because I want to make sure you don’t miss the message. I want to give it a minute to sink in so you realize that “all” means you. It also means those who you might not realize are welcome alongside you at the Lord’s Table. Here at Abiding Presence, “all” really does mean all...everyone...no exception. Why? Because the communion table isn’t our table. When you get down to it, Abiding Presence isn’t really our church either. It’s Jesus’. It’s Jesus’ communion table and Abiding Presence is Jesus’ church. When we look at Jesus’ witness - his life, death and ministry - we see that the kingdom of God has come near for the sake of the world that God’s so loves. God’s desire is for everyone to believe in Jesus - everyone, without exception. In Jesus, God’s kingdom came near for you and for me, the faith and the not so faithful, the people we agree with and the people we don’t, the people we love and the people we strongly dislike (note: I didn’t use the word “hate”…remember last week’s sermon?). We are not the gatekeepers of the kingdom of God. That’s a position far over our heads best left to God alone! Instead, we are inviters to and proclaimers of the good news of Jesus, which is good news that God wants all people to hear. Our Lutheran proclamation that “all are welcome” is good news that needs to be shared. I hope this week that you will take a few moments to prayerfully consider who in your life needs to hear the good news of Jesus. Who do you know that needs to hear that God’s love is for them? How might God be calling you to be an inviter to and proclaimer of that good news that Jesus came for them, too? Think about it. Prayer about it. Act on it. There’s a world out there that God loves and God wants to hear the good news of Jesus and we are the hands, feet and voice God has to proclaim it. What is faith? How would you describe your faith in one sentence? What difference does your faith make? These are some of the questions I posed to our pre-confirmation 6th graders this past Wednesday night as we sat in my office talking together. “This is getting deep!” one of them said to me as we wrestled with the idea of faith together. Indeed, faith can sometimes seem like one of those deep conversation topics that is hard to grasp. In the biblical book of Hebrews, faith is described as “the assurance of things hoped for, the conviction of things not seen (11:1).” I encourage you to commit this verse to memory, highlight it in your Bible and recite it often. It’s short, sweet and to the point. Faith is both hope in God’s promises for the future and conviction, or trust, in all of God’s works that we cannot see. The pre-confirmation youth and I talked about how God gives us all the faith we need. We don’t have to go out searching for faith. We don’t have to worry about if we have enough. God is the giver of faith and God always provides. This conviction that God has and will give us faith is something in which we can take comfort. But, that’s not all! Faith is like a muscle. We all have it, but only some of us exercise it. When we exercise our faith, it gets stronger. We can feel it in a more pronounced way. It becomes visible to others. Faith becomes something we think about and engage with through the exercise of worship, prayer, scripture reading, service and life together in Christian community. As I’m passionately discussing exercising faith with our 6th graders, one of them looks up at me and says, “So, basically, pastors are body builders.” Immediately, there was lots of laughter from all of us! But, it is not just pastors who are called to be body builders, it is all of us in this faith community who are called to exercise our faith and coach others along in exercising their faith, too. I continue to be amazed by the faith of our young people and the ways that God is working in and through them. I’m thankful for all of the teens and adults in our congregation who are serving as body builders of the faith to help our children learn how to exercise their faith muscle. I hope you will prayerfully consider how God might be calling you, too, to get involved in body building in our faith community. How Much is One Ton of Food? The calendar has now turned to February, which means that it is time for us to get to work stocking the ECHO food pantry. While we support ECHO’s work and collect for their food pantry throughout the year, February is the month when Abiding Presence takes responsibility for ensuring there is plenty of non-perishable food, toiletries and household products on hand to meet the needs of our neighbors. Stocking the ECHO food pantry is February is a longstanding Abiding Presence tradition. It is also more important than ever as the needs of our neighbors increase. So, what can you do? Bring food, toiletries and household products each and every time you come to church this month. When you’re at the grocery store stocking your pantry, replacing your shampoo or picking up laundry detergent - buy double and bring one set to church for ECHO. If you’re grabbing cans from your pantry, make sure they haven’t expired. If you have children or grandchildren, take them with you to the store to help shop and then bring the items to the donation bins at the church. It’s a great way to instill a sense of service from a young age. Our goal is big - ONE TON of food, toiletries and household products! The fact that February is the shortest month of the year doesn’t deter us from setting a big goal. We know that working together we can meet the needs of our neighbors and ensure that the ECHO food pantry is well stocked. The Church Council and I are excited to share the news that Abiding Presence is launching the “Abiding Presence Lutheran Church Fund for Leaders Scholarship” through the ELCA Fund for Leaders in Mission. The ELCA Fund for Leaders scholarship program supports students of tremendous promise attending ELCA seminaries. By making seminary more affordable, the ELCA Fund for Leaders enables more future ministers to go to seminary and helps them graduate with less debt, empowering those whom God calls into ministry to go and serve as the church needs and the Holy Spirit leads. 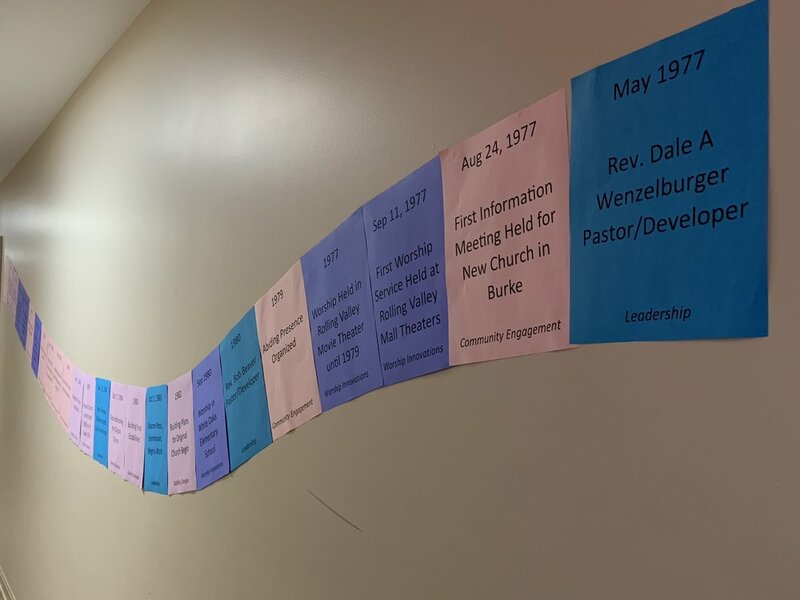 As we celebrated our 40th anniversary earlier this year, we remembered the many pastors our congregation has lifted up over the years. We have sent six sons and daughters of the congregation to seminary. As an internship congregation, we have also provided training for six seminarians. Looking to the future, I believe we have several future pastors, deacons and church leaders who we are raising up in our midst. Rev. Mark Olsen, one of the sons of the congregation who Abiding Presence sent off to serve the larger church as a pastor and now the Associate Director for the ELCA Fund for Leaders, will be will us on Sunday, January 27 at the congregational meeting to celebrate the launch of our Fund for Leaders scholarship. For those of you who would like to visit with Pastor Olsen and his wife, Kari, they will be worshiping with us at the 8:45 a.m. service as well. On a personal note, this week I will celebrate my 13th anniversary of ordination. When I began seminary in 2002, I received a full tuition Fund for Leaders scholarship. The scholarship was not only allowed me to graduate seminary without having to take out loans, but was also a constant reminder of the support of the whole ELCA of my call to ministry. On the hard days of ministry, I still find strength in the support and financial investment the larger church was willing to pour into me. I live out my ministry hoping that the larger church sees a return in their initial investment in me. As I look ahead to another year of ordained ministry serving Abiding Presence, I am also mindful of who will step into my shoes in the future. The need for innovative, faithful and willing pastors to serve ELCA congregations is great. I wonder how the Holy Spirit might be working in the lives of our young people and even, too, our older people to answer that call. One of my seminary classmates was in his early 70s when he began seminary, so you’re never “too old” for the Holy Spirit to call! I believe that in our next 40 years together that we will send off even more people to seminary to serve the larger church as pastors and deacons and I’m delighted that we are taking the steps now to prepare to be able to fund their theological education for the sake of the whole church. We’ll be talking much more about the “Abiding Presence Lutheran Church Fund for Leaders Scholarship” at the café sessions this weekend and at the annual meeting next Sunday. In the meantime, please don’t hesitate to be in touch if you have any questions about it. Nadia and I took advantage of the nice weather one afternoon this past week to scooter together around the neighborhood on our scooters. She was only a little bit faster than I was up the hill! As some of you may have heard, I had some minor post-holiday foot surgery to take care of an old injury that flared up and wouldn’t heal on its own. At this point, I’m well on the way to recovery with the minor inconvenience of not getting around quite as easily as I normally do. I’m back in the office and leading worship and looking forward to seeing all of you. While I’m always grateful to be part of our amazing faith family, I’m especially grateful in times like these. Having so many offers for help from people who I knew I could call on was invaluable. Thank you! Here at Abiding Presence, we’re always looking for ways to support each other and the community. We’re excited to be launching a new support group this month for parents and caregivers of children with ADHD that is affiliated with CHADD, a national ADHD organization. The first meeting will be Thursday, January 24 at 7:00 p.m. and is open to people in the church and community. The support group was the idea of one of our members who was looking to connect with other parents of children with ADHD. Abiding Presence was happy to help provide encouragement and resources to make the group a reality. Our Parents of Teens Group will also resume meeting this month on Wednesday, January 23 at 7:00 p.m. This group is facilitated by a licensed social worker from the community who comes in to provide conversation and guidance for parents raising teenagers. We also host a monthly Metal Health Family Support Group facilitated by a pastoral counselor. If you have an idea for a way that we can better support one another and you’re willing to help take a lead in making it happen, please reach out to me. The church and I are here to provide encouragement and resources. I’d love to see a relaunch of our meal ministry to provide meals to members of the congregation who may be recovering, grieving or welcoming a new family member. I also know there are plenty of other support groups that might be helpful for us to launch or community groups with which we can connect. There are lots of possibilities, we just need people with a bit of time and passion. WOW! You never cease to amaze us. Thank you for the faithful, generous and inspiring financial commitments you have made for 2019. It was an amazing weekend last weekend celebrating what God is doing in our midst. So far, 136 households have offered commitments for the coming year. We reached the $5,000 challenge gift goal of 75 new/increased commitments by Celebration Weekend last weekend AND the $2,000 challenge gift goal of 50 additional commitments by Thanksgiving. That’s an additional $7,000 for our ministry this coming year. Thank you to all of you who have committed to helping make our vision a reality in 2019. There’s still time, though, for those of you who have not yet submitted your commitments to do so. We promised in last week’s e-news that there was news coming about a big step we are taking right now toward our 2019 vision. Now, we’re ready to share that news! We have hired Katy Moran as Interim Senior High Youth Director. We have been dreaming about and praying for a Senior High Youth Director for several years. When Pastor Keseley met Katy at a synod meeting, she immediately recognized her as having the gifts and skills of the kind of person for whom we have been praying. While we weren’t in any kind of formal search process to hire a Senior High Youth Director, the church council decided to embrace this “Holy Spirit moment” and bring Katy on board through May. Katy comes to us as a member of Holy Cross Lutheran Church in Herndon and a 2018 graduate of Longwood College. She started college with plans to become a special education teacher and then heard the call to ordained ministry. She will start her Master of Divinity at United Lutheran Seminary in the fall of 2019. Katy has spent the past five summers on the staff of Lutheridge Camp in North Carolina. She is well trained and equipped to bring all of the faith and fun of Lutheran summer camp to our youth ministry. Katy will work alongside our existing youth ministry team “Making Firm the Foundation” in preparation for our Log College Project grant project that will launch next fall. Katy will start with us Sunday, December 2 and will be present at both worship services and the Abiding Table that morning. Please take a moment to introduce yourself and welcome her to Abiding Presence when you see her. We’re thankful for the work of the Holy Spirit that has connected us with Katy and for the opportunity to bring her on board for this school year. We say this often, but we continue to feel like it is an exciting time to be the church here at Abiding Presence. Thank you for all the ways you are helping to grow and shape our ministry for the sake of the world. This Weekend is Celebration Weekend! You are an amazing group of people! Our congregation never ceases to surprise me. Watching the Holy Spirit work in and through you is a tremendous blessing. Looking ahead to 2019, I can honestly say that I am as excited as ever to take get to work Making Firm the Foundation at Abiding Presence. Thank you for ALL the ways you come together to be the church to make ministry happen. This weekend we are going to celebrate! As of this moment, we have 105 households who have offered financial commitments for 2019. A big thank you to all of you! Of those 105 commitments, 81 represent new or increased commitments. I am thrilled to share that we not only met, but also surpassed our goal of receiving 75 new/increased commitments by this weekend. This means we will receive a $5,000 one-time challenge gift from a family in the congregation. What a blessing! But, that’s not all. When it looked like we were closing in our first challenge gift goal, another family came forward to offer a second challenge in order to help emphasize just how much every single commitment – regardless of size – matters in our faith community. We currently need only 29 more households to offer their commitments prior to Thanksgiving in order to receive a second challenge gift of $2,000. If you haven’t yet submitted your commitment, please help us meet this goal. You can submit it online or we will have commitment cards available at worship this weekend that can be placed in the offering plate. This weekend we are going to celebrate…and get to work making our vision a reality as we seek to together be the church for the sake of God’s world. We will be blessing quilts made by members of the congregation to be sent to Lutheran World Relief and then distributed to people around the world in need. Our Log College Project Design Team will be commissioned at the 8:45 a.m. service as we get to work re-imagining our ministry to and with senior high youth. All of our pre-confirmation kids who have baptismal anniversaries in November will be recognized and blessed. We’ll gather around one of Michael’s home-cooked breakfasts at the Abiding Table for faithful conversation. Our Sunday School kids will gather in their classes for another week of learning. This week’s gospel text and sermon will help us think about our response as disciples of Christ to the brokenness of the world. Then, in the afternoon, we will gather for the CROP Walk with other faith communities in our area to stomp our hunger. It’s going to be quite a weekend. I hope you will both be at church and be the church. Oh, and that’s not all…the church council and I have an exciting announcement to share about something your generosity is going to allow us to do right now to take a big step toward furthering our vision. We’ll be sharing the good news during the announcements at worship and follow it up with a congregational letter next week. Thank you! Thank you for your commitment to being the church and for the privilege of serving as your Senior Pastor. A couple of weeks ago I was teaching confirmation and I watched it “click” for one of our confirmation kids. I had a group of them standing around the baptismal font learning about what it means to be baptized children of God. We were talking about the promises God makes to us in the baptismal waters and suddenly the magnitude of these promises hit a particular kid. It clicked. Being a baptized child of God suddenly meant something and was relevant in a way it never had been before. I watched as if a weight suddenly came off this young person’s shoulders, a smile spread across their face and they exclaimed with sheer joy. It was amazing! In that moment, standing around the baptismal font, I took a moment to silently give thanks for the ways this particular faith community is changing lives…literally! Around this same time, I asked one of our church members to do something particular to their professional background. The church had a specific need and I knew this person was the person to meet it. I also knew I was probably asking a lot. It wasn’t a quick hour or two and done kind of thing. When I checked back in with them about it, I was blown away to hear them say to me, “This project has been a blessing to me,” and then they went on to tell me how. In the midst of an unexpected turn in the conversation, I once again took a moment to silently give thanks for the ways this faith community is changing lives…literally! Again, around this same time, someone walked into the church off the streets looking for assistance. I engaged in the usual conversation about grocery gift cards and our food pantry when the person said, “I know this is a church, but I have this problem…” At this point we sat down and they shared their story. I was able to speak a word of God’s love into their story where they had previously heard judgement and condemnation from the religious community. Sitting in that suddenly holy moment, again I silently gave thanks for this ways this faith community is changing lives…literally! Week after week, I am privileged to see the impact Abiding Presence is making on people’s lives – both people in our congregation and people in our larger community. Thank you for the ways you make this life changing work possible through both your presence in our faith community and your financial support for our ministry. This week we are asking you to please make a financial commitment to Abiding Presence for 2019. For those of you who have been around for a while, you will recognize this as our fall stewardship campaign. For those of you who are new to the church, this is the way we anticipate income for the coming year in order to responsibly set a budget for our ministry. We need to raise $60,000 in new income for 2019 to make our vision for ministry a reality. I hope you will join me in increasing your commitment to Abiding Presence for the coming year. Additionally, this year we have a challenge grant of $5,000 that has been offered if we meet our goal of 75 new or increased commitments received by Celebration Weekend – next weekend! Please turn your commitment in online or on paper by this Sunday at noon. Next week our stewardship team will be calling households who have not yet turned in a commitment to invite them to be part of making our vision a reality. Thank you for all of the ways that you are the church. Thank you for the ways you open yourselves up to be transformed in this community. Thank you for the ways you are being the hands, feet and voice of Christ to others in our faith community and beyond. We are the church together. As always, I am grateful for the privilege of being the church with you as your Senior Pastor! All Saints Sunday is one of my favorite Sundays (and Saturdays). I look forward to singing For All the Saints all year long. The reading of the names of those who have died this past year is one of the most sacred acts I am privileged to perform as your pastor. The image of the great cloud of witnesses surrounding us is one to which I personally cling in my faith life. This year, we’re observing the Festival of All Saints a bit differently. Rather than scrolling the names of our loved ones who have died, we are creating a visual display around the altar. We will see a glimpse of the great cloud of witnesses that gathers with us each time we worship and celebrate the Lord’s Supper. There will be pictures and names of people who have passed away. It’s not too late for your loved one to be included! Simply bring a picture with you when you come to worship and place it on the display at that altar. We will also read during worship the names of all of our loved ones who have died since the last Festival of All Saints. We will toll the bell for each person who has entered into the great cloud of witnesses this past year. All Saints isn’t just a time of remembering those who have died, though. It is also a time of giving thanks for the living saints among us. We will begin our service around the font reading the names of all those who have been baptized since the last Festival of All Saints. We will celebrate these living saints who have been named and claimed as children of God and who are counted among God’s saints today. We are all saint…and sinners…and when we worship we are joined to the great cloud of witnesses who have gone before us. So let us come together to give thanks “For all the saints who from their labors rest,” the saints among us and the saints to come. I write to you with a heavy heart as I continue to grieve the horrific acts at Tree of Life Synagogue in Pittsburgh. Any killing or act of hate is tragic, but when it happens in a sanctuary while people are worshiping it hits especially close to home for people of faith. As the faith family of Abiding Presence, we will continue to denounce acts of hate in our community, nation and world. In light of the multiple hate-filled attacks this past year on the Jewish Community Center in Fairfax and now the horrific killings at Tree of Life Synagogue, we join our voices to those who condemn hate, violence and anti-Semitism in all forms. As I preached this past weekend, our baptismal liturgy guides our actions in times like these. All of us share in the baptismal calling to “care for others and the world God made and work for justice and peace” (ELW baptismal liturgy). Now is the time for us to care for our brothers and sisters at Temple B’nai Shalom and in the larger Jewish community. Last night I was present at B’nai Shalom for their service of remembrance as a sign of our love and solidarity with them in this time of grief and fear. This Friday, I will be back at B’nai Shalom with some of our church council members to worship at their weekly Shabbat service and help host their oneg (AKA “coffee hour”) after the service. It is another small way for Abiding Presence to show our care, love and commitment to stand with our Jewish friends during this time. Thanksgiving Eve will be an opportunity for all of us to stand together in solidarity and support for our brothers and sisters at Temple B’nai Shalom. In light of the events of this past year and, especially, this past week, our joint Thanksgiving Eve service is more important than ever. If you are in town, please make a point to join me in being present for it. This year we will worship at Temple B’nai Shalom on Wednesday, November 21 at 8:00 p.m. In addition to answering our baptismal calling to care for others, we also need to answer the call to get to work bringing justice and peace to our community, nation and world. We will pray, but we will also turn our prayers into action. P.S. – Here is the pastoral message from ELCA Presiding Bishop Elizabeth Eaton following the attacks at Tree of Life. Rather than hearing from me this week, I’d like you to hear Bishop Elizabeth Eaton, Presiding Bishop of the Evangelical Lutheran Church in America (ELCA), reflect on the significance of the 501st anniversary of the reformation. Check out her column in this month’s Living Lutheran magazine. We will celebrate the festival of All Saints in worship the weekend of November 3-4. It is a time for us to give thanks for all the saints - the loved ones and friends who have died - and draw strength, courage and faith from them. It is one of the most meaningful weekends of worship of the whole year for me personally. In fact, I wait all year to sing with gusto the hymn “For All the Saints” as I remember the saints in my life. One of the most powerful things about All Saints Sunday is that it offers us the opportunity to know and trust that we are surrounded by a great cloud of witnesses who have died and gone before us. When we gather around the altar for Holy Communion, the air between heaven and earth is as thin as it gets. Holy Communion is a foretaste of the heavenly feast to come. It is an opportunity for us to connect with our friends and loved ones in the great cloud of witnesses in the most powerful of ways. We believe that when we share in Holy Communion that we do so with the body of Christ on earth and the saints in heaven. We’re going to try something a bit different this year as we remember the saints who have gone before us and are part of the great cloud of witnesses. We want to create a visual representation of the friends and loved ones who gather with us at the Lord’s Table not just on All Saints Sunday, but every weekend we worship. In order to do this, I’d like to invite you to bring in a picture of your friends and/or loved ones who have died. It can be in a frame or not in a frame, any size or shape you wish. Please put your name on it so we can be sure to get it back to you. Pictures can be dropped off in the church office anytime before November 3 or you can bring them to worship with you the weekend of November 3-4 and put them directly on the altar. If you would rather not bring a picture, you can fill out a name card with your loved one’s name or email the name for us to fill it out. These name cards will be displayed along with the pictures. I hope it will be a beautiful representation of pictures and name cards to help all of us experience power of being surrounded by such a great cloud of witnesses. We will also be reading the names of anyone who has died since last All Saints Sunday. If you have a loved one who has died this past year, please email the name along with their date of death (or approximate date of death). We will read these names aloud in worship. If you have any questions or would like to be involved in helping to put together our display of saints, please let me know. I look forward to celebrating all the saints with you next month. Week after week, Pastor Heidi and stand behind the altar and offer the invitation, "This is the Lord's Table and all are welcome here." Every one in a while someone stops us after the service and asks, "Do you really mean all?" We do! We really do mean that all are welcome to gather around the Lord's Table. You will be welcome regardless of who you are or where you are on your faith journey. This weekend we're launching a four week sermon series and congregation-wide study of Holy Communion. We will be dwelling in God's word and digging in to what it means to be fed and forgiven at the Lord's Table. Together, I hope we will all grow in our understanding of God's love for us that is manifest in the tangible form of bread and wine. Our preschool and elementary school Sunday School classes will be learning more about what Holy Communion means in age appropriate ways. Our senior high and adults will be gathering in small groups to expand their understanding of the sacrament beyond what they might have learned as children in holy communion classes. I'm excited for us to be on this journey together as we take a step on our discipleship journeys. Having what is called an "open table" for communion is an important part of not only the faith community of Abiding Presence, but of the whole Evangelical Lutheran Church in America (ELCA). We are quite clear as a denomination that the altar isn't our table. It's the Lord's Table. We aren't gate keepers of it, but invited guests to it. When we gather around the Lord's Table, we are fed, forgiven and sent out to invite others to come and to be fed and forgiven, too.